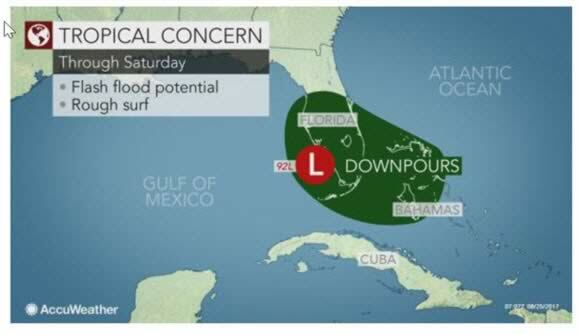 AccuWeather-(ENEWSPF)- AccuWeather reports a tropical disturbance that will continue to douse Florida with downpours into the end of the week is being monitored for possible development along the southeastern United States coast. The feature of interest, designated 92L, is a disorganized cluster of enhanced showers and thunderstorms located slightly north and west of the Florida Keys. Ninety-two L lacks a well-defined circulation near the surface, which would indicate possible strengthening. The system will continue to meander near Florida and the Bahamas through Saturday, bringing heavier and more frequent downpours than what is typical during the summer months. Urban flooding will be possible under the more persistent downpours as several inches of rain can fall in a few hours. Seas will be stirred and rip currents will be more frequent than usual across the Keys and Atlantic coast beaches of Florida. 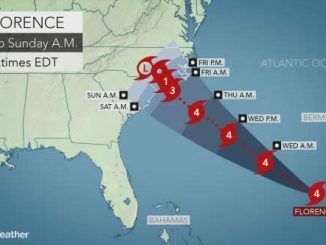 “Ninety-two L will start to move northeast away from Florida into Saturday,” AccuWeather Hurricane Expert Dan Kottlowski said. The system will continue to battle dry air, wind shear and interaction with land, which have all inhibited the system from developing thus far and will likely continue to do so into the first part of the weekend. Wind shear, or the change in wind speed and direction with altitude, can prevent disorganized features from developing and shred apart mature tropical systems. The environment may become more favorable for development once 92L drifts northeastward away from Florida. “Once back out over water, this system might reorganize and become a depression and perhaps a tropical storm late this weekend or early next week when environmental conditions improve off the southeastern coast of the United States,” Kottlowski said. The next tropical storm in the Atlantic Basin would acquire the name Irma. 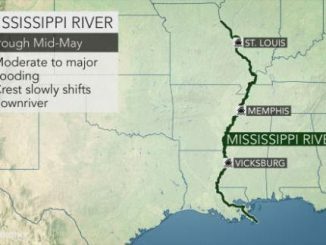 “If this development does take place, a projected steering flow over the system will guide it northeast away from the United States next week,” Kottlowski said. 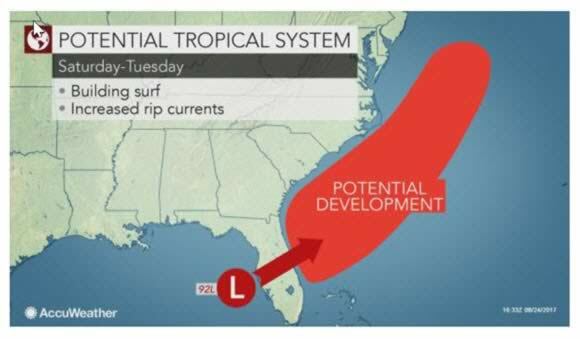 If 92L remains weak and does not get swept away by another system, it could meander near the coast for several days next week, bringing a prolonged period of rough surf and rip current danger from Florida to the Carolinas. There is the potential for the storm to get swept up along the East Coast around the middle of next week, which would spread the risk of dangerous seas perhaps as far north as the southern New England coast. Downpours from 92L could brush the Atlantic Seaboard if the storm stays close enough to the coast. Boaters and beachgoers should continue to heed all advisories that are issued until 92L has moved well out into the open Atlantic. Elsewhere in the Atlantic Basin, Harvey will pose a significant risk to lives and property over Texas and Louisiana into next week.